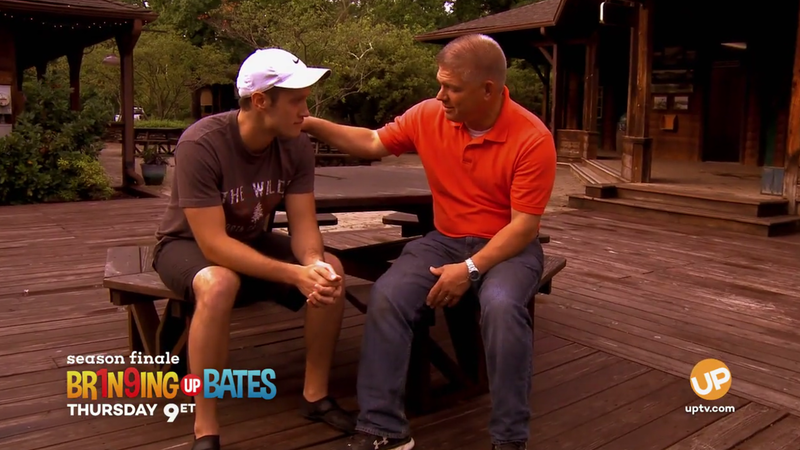 Bates Family Blog: Bates Updates and Pictures | Gil and Kelly | 19 Kids | Bringing Up Bates | UP TV: Bobby Asks Permission, Gil Says...No? What did you think about the first segment of the two-part Bringing Up Bates season six finale? Well, things are about to get a whole lot more interesting. On next week's episode, Bobby Smith musters up the gumption to ask Gil Bates for his blessing to pop the question to girlfriend Tori Bates, 21. But as you'll see in the video clip below, the confident look on Bobby's face quickly turns to sorrow as Gil says the dreaded word: "No." Oh my goodness! I wonder if Gil really said no? Maybe they made it just look that way. I'm assuming this is a "gotcha" type clip. If not c'mon. It's 2017. Tori and Bobby are adults..they can make their own decisions. I agree with you. Gil answered so fast, didn't even think about it. They have been Pro Bobby from the start. I agree. I'm sure he really didn't say no. He's making Bobby sweat. Autocorrect makes for some funny reading. Jinger Duggar becomes Hunger Danger. :) I knew who you were referring to, though. Maybe he said - not now. Last I heard, they were waiting until Tori completed her education? Where are Alyssa and John and family staying right now to get away from Hurricane Irma? Whaaaaat???? Oh wow, was it a joke? I mean, would he really say that on TV?? I'm really nervous about this now. They got me! Now I got to know what he says! It appears like it could really go either way. After Gil said that Carllin may not be mature enough for marriage yet (I know different person/different couple) it shows Gil really is looking out for his kids and not being a 'yes'-man. He really carefully considers each decision. I know this is a video for Tori and Bobbi, but how are Alyssa, John and their little ones doing? They live in Florida! Did they evacuate? I think Gil will say something along the lines of "No....you don't have to ASK for my permission, because you already have it, and my full blessing"
I home that Mr.Bates it joking with Bobby Smith, but we shall know next week. There's got to be a catch, there's just got to be a catch. I'll be waiting for one. I'm sure it was a joke...although maybe it wasn't the best timing! That's such a serious matter and I'm sure Bobby was already nervous about asking. Why would Gil say no to Bobby and Tori getting engaged. They don't need his permission. I can understand them wanting Tori's parents blessing but this is the 21st century. Ok, since I can't watch the show, will someone who did please please please tell me what Gil REALLY said?! I'm guessing this is not the whole conversation and like Anon Sep 8 10:02 said it's just a 'gotcha' clip to get people curious. I have a feeling it's either just a split video to get you to watch the next episode, but if it's not he probably just said that they need to wait till she graduated or just give it a couple more months. At least it's not like the dug gars where they date for three months and are only engaged for 3 months. I'm glad that they're taking their time to really get to know each other before taking that big of a step. You can see the Twinkle in his eyes as he says it. This is just a promo from UP to get us excited to watch. Cute, nevertheless. Can't wait to hear the whole clip. Bobby said he wanted Gil's permission to marry Tori. Maybe Gil's 'no' was followed by, 'You have her mother and my's permission/blessing to ask her to marry you'. Or he did he follow the 'no' with, 'Wait till school if finished', or 'Jest kidding'. Oh, I hope he didn't say "my's". I really don't like that particular example of bad grammar. 100% positive he didn't really say no to that particular question. I hope Gil said no to Bobby. Tori needs to grow up a little but and finish college and work for awhile before getting married and save some money first. Well jeez...they could still get engaged and just wait til Tori is done with school. Nothing wrong with a long engagement. When I got engaged, initially we were going to get married within the month which then extended to three months and then to 6 months. Lol just because you get engaged doesn't mean anything about when your wedding date actually happens. Tori & Bobby have been talking about a May 2018 wedding for a while. Tori will be done with school in the spring and Bobby has already finished. Of course it matters what Gil says! He's her father! The Bates wouldn't let Tori continue to date Bobby if they felt he was not the right person for her. Bobby has to become grounded in a job and Tori has to finish her education. No surprise there - even though Bobby was feeling let down - for now. They may be old enough to make their decision(s), however, Bobby is RIGHT in wanting the go-ahead and blessing of Mr. Bates. They are a fine example of the Christian life. The Bates would not allow Tori to continue seeing Bobby and include him in family events, if they did not approve of him. So, it's no surprise that Gil said 'no' at this time. Bobby needs to be secure in employment and Tori needs to finish her education. Mr. Bates is wise and will do what is right. They are a fine Christian family. "In the world but not of the world." P.S. Tori and Bobby may be of age to make their own decisions, however, Bobby is going about things in an honorable way by asking Gil about proposing marriage to Tori. Respectful and that is so important in relationships.